so, is the bottom line that EW is too subjective, eh ? Yup reason I have mentioned that you can't use EW alone as you will get sea sick for sure as market can always go both ways. I knew that the market had to take the resistance at 1255,56 and it failed to do so so aas it was near one of the TTT expected high. (did I mentioned this OH OH I hope Rich won't shoot me for this). For now bears have a small edge over the bulls. The market is doing a bit what I was expecting after yesterday's climb, going sideways as it needs to digest all of that so even if I haven't traded today as too busy with household duties any trade I would have taken would have been a take your profit and run type. 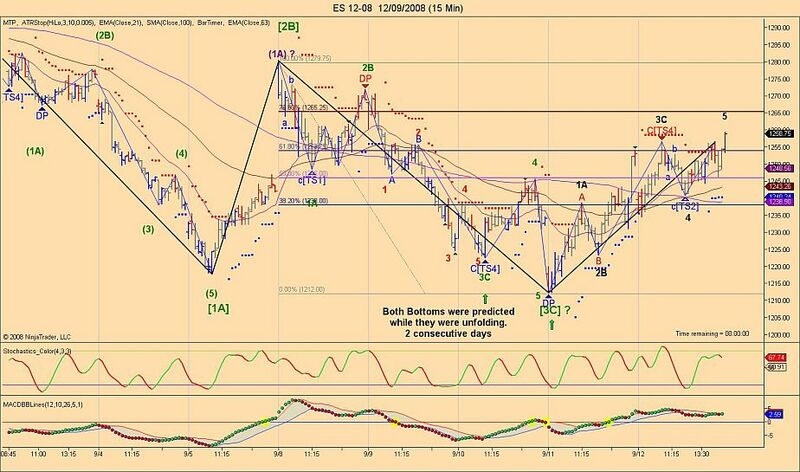 ddaytrader: Why couldnt the move from C(ts3) to wave 1 down really be D, and the bounce from there to 1303 be E? This would complete a large A. this has a better look for me since i dont see 5 waves from C to 1 down but a corrective a b c.Looking at the weekly charts, the whole move down from 1576-1200 is A.Then the move from 1200-1313 was a, and we just made b yesterday or by mon., then expected c up to complete a largeB(1340-1370). Finally the last C down to end the bear in early 09.Comments? Hi koolblue: I'm not sure how best to answer this. I am not trying to discern a Big Picture wave count. I am merely trying to find "tradable wave patterns." Your wave count sounds similar, though not without some differences, to my alternate wave count. A quick glance at my daily SPX chart indicates to me, at least, that both that neither my preferred nor my alternate count has been invalidated (unless the preferred was invalidated by wave 4's reckless intrusion into the territoty of wave one, as Laurent pinted out). As I mentioned, I tend to be a bit flexible n some of the EW rules. That may or may not change as time goes on. I am but a student here. If I were pressed into a Big Picture wave count, I would favor a count similar to that outlined by you re: the weekly charts. However, looking at monthly data, a more immediately and strongly bullish case could be made. Hi all just wanted to do a small recap on what I was able to predict with EW this week as I don't know if some of you realized what has been accomplished here. For 2 days in a row I was able to predict a bottom while it was unfolding and since no one mentioned that I said to myself have they noticed it as we just can't say that this was pure luck. Anyway I hope you realized that bottoms and tops can be spot while using EW and with the help of the other tools like the TTT book. I will probably post less of these live trades as it is becoming for me too difficult to do so with the fact that I must take snapshot reduced them and label them so while I do this I can't concentrate on my own trading. So the difference might be that I could post but a few hours later or at the end of the day. I got your special email concerning the charts with the EW counts, very similar to Laurent's last post. And low and behold when the futures opened Sunday evening they sank like a rock. Nice job to both of you. Right now at about 2000 Sunday EDT the markets are resting on the projected TTT lows, I guess we will see how things are going in the morning. 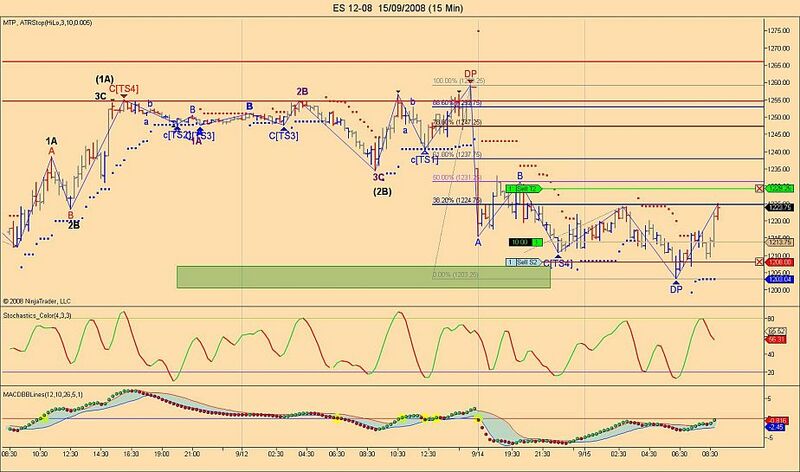 Thanks Larry for the recap and we understand that you need to trade too. I didn't post about your accuracy, but I was saying to myself "dam, he nailed that wave count!". Rich, as I mentioned to you directly, your special email was really helpful and hope you can send them often. Thanks. if we get down much further overnight then the wave count just might go out the window. "Therefore, we could see a reversal down, or some sideways back and fill for a day or two or three before the wave 5 down to 1178.27-1182.66 (a wave 5 target within a larger 1169-1186 target zone). I favor this count." Now, the question as to the larger degree of which this is but a part remains: <y preferred count would have this as a wave 5 down of a Wave 1 down of a WAVE C down, meaning we should get a rally that will correct the entire decline form the May high to wherever we finally print a low of this current wave, and then we should get a "grab a railing this thing is going down" decline in a Wave 3 of WAVE C down. There are others, which I will discuss at another time.